After my post on the beauty benefits of rosewater, a lot of you have written in to ask whether it’s possible to make this fragrant multi-tasker at home. Yes, it’s definitely possible to make rosewater at home – and it’s easy enough. In fact, growing up, I always looked forward to visiting my grandmother in her pretty summer cottage, which was steeped in the fragrance of meltingly luxurious rose creams and fluffy rose-dusted powder puffs. 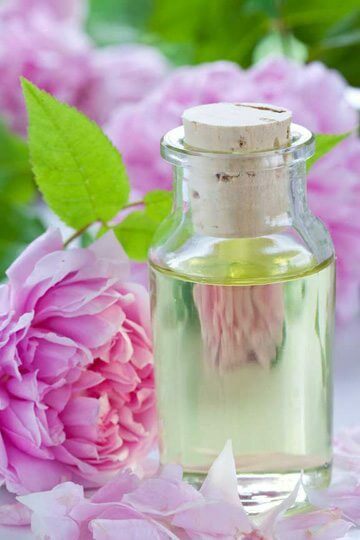 While these sweet smelling lotions and potions are no longer within reach, these DIY rosewater recipes bring back those wonderful memories of playing dress-up in her bedroom. I hope you love them too! Fill the bottom 3-4 inches of an enamel pot with rose petals. Pour distilled water over them until they are just covered. Heat the water till it starts steaming but do not let it come to a boil. Simmer until the petals lose their colour. At this point, the water will have taken on the colour of the petals and you will see oil on the surface. This will take approximately 60 minutes. Strain the water and squeeze out the liquid from the petals. This is your rosewater. Place 1 firmly packed cup of rose petals in a glass jar. Pour 2 cups of boiling water over the petals. Cover and steep until the liquid is cool. Strain, squeeze out the liquid from the petals, and refrigerate the liquid in a sterilised jar. Line a heat-proof enamelware roaster a few inches deep with rose petals. Add distilled water until the petals are just covered. Place the roaster (uncovered) in the oven and bring to a boil. As soon as it starts boiling, turn off the heat and cover the roaster. Leave in the oven until the water is cool (several hours). Once cool, strain and squeeze all the petals to remove the liquid. Refrigerate the liquid. Fill the bottom of an enamel canning or stock pot with 4 quarts of rose petals. Pour distilled water over them until they are just covered. The rim should be at least a couple inches higher than the water. If you have a canning rack, you can set the bowl on top of that so it doesn’t sit directly over the heat; else a pyrex loaf dish underneath the bowl would do the trick. Cover the pot with its lid, but position the lid upside down so that you have a dipped “container” to hold the ice on top (to be added later). Now turn on the heat and bring the water to a boil. Once it starts boiling, fill the top of the inverted pot lid with ice cubes. Turn the heat down and keep at a bare simmer for about two hours. Top up the ice as needed and check occasionally to see that the petals don’t boil dry. This process will enable condensation to form on the top inside of the pot lid. The condensation will drip down into the bowl inside the pot – the liquid inside the bowl is your rose water. The best roses for making rosewater are the Rosa damascena, Rosa centifolia and Rosa gallica. All three of these rose species is edible, so you can also use them in teas and flavourings. 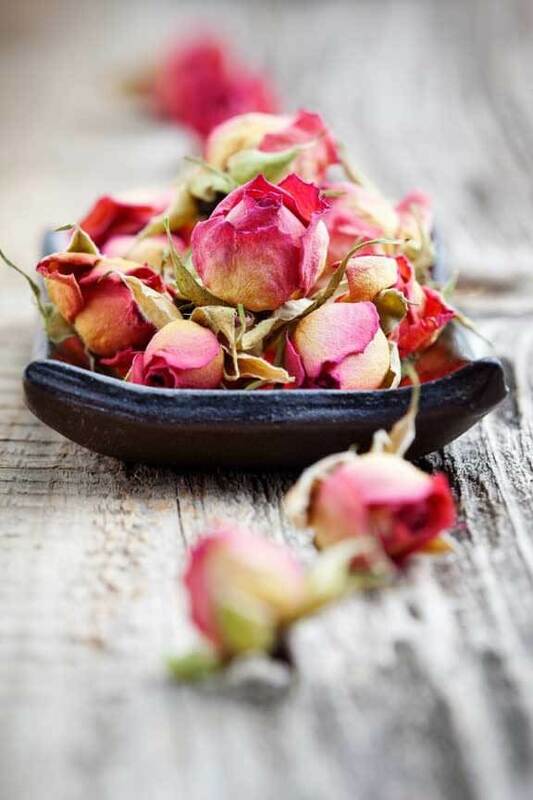 Rose petals must be freshly picked and be completely free of pesticides or other chemicals. If you don’t grow your own, ask at the local florist or farmers market for organic ones. Pick the flowers just after the morning dew has evaporated – around 2-3 hours after sunrise. Use only the rose petals, not the stems, stamen (the “male” part at the centre of the rose, where you find the pollen) or leaves. Wash thoroughly to remove any bugs or dirt and immediately process with one of the methods above. After preparing your recipe of choice, refrigerate in a sealed, sterilised glass jar. Add 1 part rubbing alcohol or vodka or witch hazel to 10 parts rosewater to use as a facial astringent or toner for oily and combination skin. Do all the methods preserve the benefits of rose water equally? I have a question about the first recipe – do you keep a pot covered while simmering the petals? Cause I’m pretty sure that the water would have evaporated almost completely after an hour of simmering. or simply buy suparna’s rosewater 🙂 her stuff is at flat 50% off on international women’s day – just thought i should let you know. cheers. The Good Earth one is also superb! I made this a few hours ago. The water took on a deep red color and smells like someone cooked broccoli in it. I used freshly picked(pesticide free) rose petals, the jar was sterilized before I used it, the water was boiling but I have no idea why it smells like broccoli. I used the quick and easy rose water recipe. That would usually happen only if the stems were pulpy or a tad dirty… could that have been the case? Why not just use a steel pot?